Russian Child in a Jewish School. Following a fiasco in the public school where unruly children terrified Emily, we enrolled her in Bais Yakov, the most Orthodox Jewish school for girls in Chicago. Polina went to daycare there. For the meeting with the principal, I knew to wear clothes that left only my face and hands exposed. She amiably agreed to let us pay fifty dollars a month in tuition but upon discovering that Emily did not have a Jewish name (usually the name, in its traditional form, of the person after whom the child was named), in addition to her regular first name, she launched, with a martyr’s expression, into a nursery-level explanation of the custom. She suggested a Jewish name of Miriam for Emily and Tsiporah for Polina. Emily could not invite her new friends over because we did not keep a kosher home but she was frequently invited over for Shabbath and sleepovers. Her English became fluent quickly. I loved the large, chaotic, sociable families where she was always welcome. The volunteer’s son picked us up in a long soft-riding car. We remained silent and a little afraid of the dark streets, wondering if the young man knew where he was going. The house stood at the end of a winding driveway. The family did the mitzvah for us and another couple, a physician and engineer, only days in the country and anxious about the medical license exams. The host, an electrical engineer, owned a small firm. The wife did not work. They had five teenage children. An engineer living in such luxury! To say that we felt out of place would be an understatement. First, we clustered around the grandmother who spoke Yiddish. We were flattered that she flew in from Florida to meet us. The harmony did not last. Whereas her illiterate parents had reached America’s shores with nothing but the clothes on their backs, we, well-to-do professionals, even doctors, were fleecing American Jewry. The ceremony dragged on interminably. Emily and Polina kept asking for food, thankfully in Russian. Dima muttered, “What if somebody is diabetic?” The hosts read the Hebrew portion of the prayer books; the guests read the text in the Latin alphabet. All eyes burrowing into us, we stumbled and cleared our throats and held up the ceremony. Gloria, a daughter of Jewish immigrants from Ukraine, implored us to put the frustrating episodes in perspective: “Scratch the surface, and I’m the same. But I feel that we, here, should listen to you.” She reminded me how it puzzled her that I had stood in lines instead of calling for delivery. And when we mentioned we were not Party members she asked which Party. Dima said that we were scaling a mountain, and new views opened every day. We emerged from his handymanning and wistful visits to the magic-trick store and my house cleaning and translation gigs with a certainty that, as Mr. Rosenthal had predicted, the world would one day be our oyster. In January, 1977, Dima had his first job interview at a small engineering firm in Downtown. Mr. Rosenthal told him to treat it as a practice run. It was normal, he said, to go through many interviews before landing a job. Dima left the house way ahead of time to account for any improbable eventuality. He was angry at himself for not bringing a few sheets of toilet paper, just in case. He bought a newspaper then was amazed that the bathroom in the lobby had a toilet paper roll in each stall – he checked. Dima got hired as a draftsman at a salary of five dollars an hour, six-hundred-fifty a month after taxes. Now the world was our oyster. Dima got paid by check, not cash. His boss dropped it off at his desk in a sealed envelope. The reality of using a bank account remained a novelty. Dima worked overtime when offered. Nobody cheated, he said – two hours of unsupervised overtime was just that and not a minute less. The boss’s teenage son worked part-time for his father: he cleaned the offices, moved furniture, removed garbage. He was paid a salary, also by check. We were not accustomed to the concept of youngsters working before they finished school. And working in a menial job when your father is the boss ‒ that was simply unimaginable! We noticed that high school and college students worked in stores, at the dry cleaners, in restaurants, everywhere. Even if their parents could provide for them. Soviet intelligentsia would be ashamed to show their face to the world if their children worked as salespeople or waitresses or in menial jobs. Sharing The Riches: The Soviet Way. We did not yet need a car. Dima took the “L” train to work. For grocery shopping I used a cart found in an alley. It was tricky to navigate in the snow but easier than schlepping the finger-numbing avoskas in Kiev and cheaper than buying a car. Overwhelmed by different prices for identical items, Russian immigrants made it a sport to seek out the lowest. We kept track of prices at half a dozen stores then went back to buy. As we began valuing our time, it dawned on us that the savings were meager for the effort invested. Our passbook savings account boasted twelve hundred dollars, including the four-hundred-fifty from Kiev and about two hundred we accumulated at the Rome flea market. I added something every month, even if it was only five dollars. I bought more stuff for parcels to Kiev than for myself—I could always get what I wanted. My booty came from the joyous expeditions to the basement of the Goldblatt’s department store. It did not occur to me to explore the upper floors; nothing could be better than the bins in the basement filled with awe-inspiring clothes. My friends in Kiev swooned over the parcels and pleaded with me not to buy such exquisite items until we were firmly on our feet. For the parcels to end up in my friends’ hands, one had to adhere to rules. The Soviet customs service guarded the health of the Soviet ideology and curbed the black market supply. But I had not graduated from the academy of Soviet life for rules to stop me. A piece of bubblegum taped to the inside of the envelope was currency—for two pieces a pharmacist “found” a medication for my friend’s mother; for one piece a mayor of a small town let our acquaintance’s family get a sack of potatoes for the winter. Fabric stitched into a skirt, labels attached, went through without a hitch even if the label belonged to a coat. The knowledge of synonyms facilitated the inclusion of multiple women’s tops, for example: tennis shirt, golf shirt, sport shirt instead of three shirts. Our glossy color photographs were greeted ecstatically in Kiev. In the letters that accompanied them, I described the scenes in the pictures, the process of ordering them in a pharmacy, of all places, and explained that black-and-white photos were more expensive than color. Self-appointed news anchor (Dima declined the honor), I wrote to his and my friends regularly. I felt as though I wrote to myself had I still been in Kiev. I knew exactly what would be of interest—everything. While accounts of abundance, choices and the “customer is always right” canon mesmerized my recipients, they could not comprehend my everyday routine: “If you don’t have to stand in lines, what do you do with your time? Why do you complain that you are busy?” Years later, I saw some of my letters and was stunned by how dull and simplistic they sounded. (Our children did not remember our former life. Emily wondered why anybody in Kiev would come to a restaurant if the waitresses were rude and, more to the point, how could a discourteous waitress keep her job in the first place. The rewiring in ourselves that Dima and I had not noticed was formidable. Many an anxiety and perplexity fell by the wayside. We took the thank-you in stores for granted. We learned the concept of raincheck and brunch. We did not ridicule the preference of seedless grapes; stopped boiling milk before drinking it; took for granted tangerines; and got used to the breakfast-cereal phenomenon. 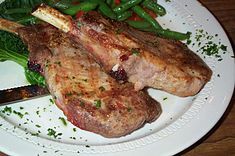 A restaurant meal became not a major event but a chance to enjoy the company or simply avoid cooking. McDonald’s sent our hearts aflutter. 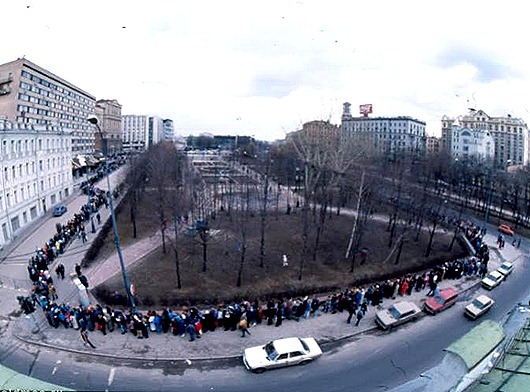 LIne to first McDonalds in Moscow in 1990. (Photo from http://vakin.livejournal.com/898179.html). We attended a movie we could not yet understand just to see what popcorn was. We would not dream of visiting anybody unannounced. We returned clothes, changed orders, sent back cold soups, and subscribed to the usefulness of doggy-bags. We did not hesitate to ask for an additional cashier if a queue moved slowly. Kiev. 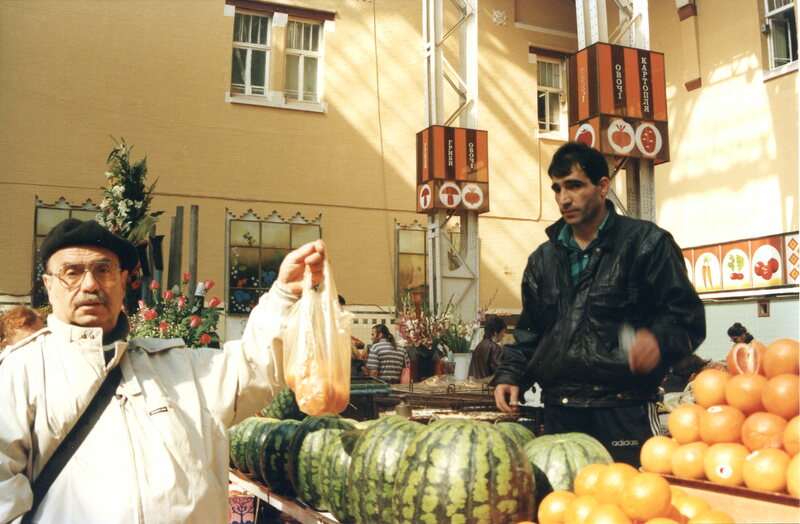 Bessarabka market; citrus-seller. Year 1997.
it took a minute to understand why all the heads in the vicinity of the mustached Georgian reigning over pyramids of citruses turned in our direction when we put a few tangerines in a bag ‒ we looked too carefree to be parents of a child so sick it needed tangerines. To top it all, Dima who had lived for the first thirty-one years of his life with his mother in one room of a communal apartment asked a former coworker who resided in a one-room apartment where her bedroom was ‒ she pointed to her couch.